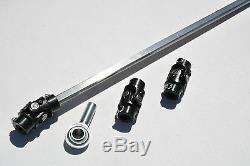 This is a new (3) Black U-Joint Steering Shaft Kit with Support Heim and 3' Polished Stainless Steel shaft for use with Mustang II POWER Racks. The first U-Joint goes to 3/4"-36 power rack & pinion, the second U-joint connects two sections of the 3/4"DD shaft (after you have cut to desired lengths), and the third joint connects to a GM steering column with 3/4-36 spline shaft. 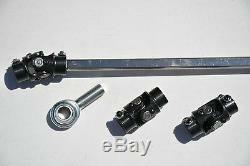 3' (3/4DD Cut-to-Size) Polished Solid Stainless Steel steering shaft. (2) TWO 3/4"-36 X 3/4"DD BLACK U-Joints (#003 BLK x2). 3/4"DD X 3/4"DD BLACK U-Joint (#001 BLK). 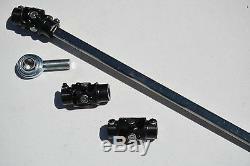 3/4 Zinc plated Steering Shaft Support Bearing / Heim (no bolt). Design and shape of U-joints may be slightly different than what is pictured. New items are being added daily. 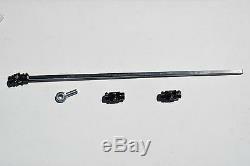 The item "Mustang II POWER 3 Black U Joint 36 Polished Steering Shaft + Support Kit 3' GM" is in sale since Saturday, May 26, 2018. This item is in the category "eBay Motors\Parts & Accessories\Car & Truck Parts\Suspension & Steering\Steering Racks & Gear Boxes". The seller is "autoaccessories4u4less" and is located in La Porte City, Iowa. This item can be shipped to United States, Canada, United Kingdom, Denmark, Romania, Slovakia, Bulgaria, Czech republic, Finland, Hungary, Latvia, Lithuania, Malta, Estonia, Australia, Greece, Portugal, Cyprus, Slovenia, Japan, Sweden, South Korea, Indonesia, Taiwan, South africa, Thailand, Belgium, France, Hong Kong, Ireland, Netherlands, Poland, Spain, Italy, Germany, Austria, Bahamas, Mexico, New Zealand, Philippines, Singapore, Switzerland, Norway, Saudi arabia, Ukraine, United arab emirates, Qatar, Kuwait, Bahrain, Croatia, Malaysia, Brazil, Chile, Colombia, Costa rica, Dominican republic, Panama, Trinidad and tobago, Guatemala, El salvador, Honduras, Jamaica, Viet nam, China, Antigua and barbuda, Aruba, Belize, Dominica, Grenada, Saint kitts and nevis, Saint lucia, Montserrat, Turks and caicos islands, Barbados, Bermuda, Brunei darussalam, Bolivia, Ecuador, Egypt, French guiana, Guadeloupe, Jordan, Cambodia, Cayman islands, Sri lanka, Luxembourg, Martinique, Nicaragua, Oman, Peru, Paraguay, Reunion, Uruguay.